This beautiful Cave Creek home is located in the exclusive Canyon Ridge Estates. This 2002 home boasts five bedrooms, three and a half baths on a large lot of 1.6 acres. It is currently listed at $889,000 after dropping thirty thousand dollars from its original price when listed a month ago. The home is located in Maricopa county near great schools such as Sonoran Trails, Cactus Shadows, and Black Mountain. Its address is 5719 Canyon Ridge North Drive, and it has stunning views of the surrounding mountains. The house has definite curbside appeal thanks to its carefully planned landscaping complete with a paved courtyard, seating area, and bubbling fountain. There are even several cactus plants that add to the home’s natural surroundings. This ranch style house could easily be mistaken for a modern Italian villa thanks to painted stucco finish, straight lines, and dynamic entry way. You will notice luxurious details before even entering the home. For example, the front wooden door gives the home a rustic appearance, and the large windows draw you inside. Inside the house has plenty of natural lighting and a high ceilings. It features a large chef’s kitchen, plenty of storage space, and a large rooms that still feel cozy. All of the bathrooms are filled with modern and luxurious amenities. The house is surrounded by delicate block and wrought iron fencing that will keep your family’s property safe. If anything, the best part of the house is the backyard where you will find a large space complete with an amazing heated pool and breathtaking views of the surrounding desert landscape. You can cool off in the pool all year long, and there is plenty of room to entertain inside and out. This is one home you will definitely want to show off to all of your friends. There covered patio and a built-in BBQ will be perfect for throwing impromptu parties. Everything in this home is made from the finest materials available. The home is 4,500 square feet in total. You will find carpet and stone flooring throughout the house. It has three telephone lines, a built in security system, and satellite TV. The master bathroom features his and her sinks, a large Jacuzzi tub and a separate shower. The kitchen comes equipped with all new furnaces including a disposal, refrigerator, and dishwasher. 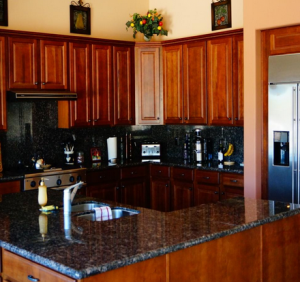 The counter tops are finished in granite for a luxurious look that brings the whole kitchen together. There are also two fireplaces to keep your home cozy and warm during the winter. If you are looking for a home that has it all, then it will be hard to find another house that is perfect as this one. It is in a great location for schools, and the neighborhood is safe and welcoming. Plus, you cannot beat the incredible view of Black Mountain from the backyard. You will want to visit this house while it is still on the market because there is a good chance that this one will go fast! For more information or to schedule a showing, visit our Contact Us page.